I have so many childhood Christmas memories. I was planning to put them all in one post but that would be too long! So let's do it one at a time. Let me start with a Christmas tree. For I think I was in Grade 4 when we had our first artificial Christmas Tree. Prior to that, my family used to create Christmas Trees from strings, papers, etc. because a Christmas tree was so expensive. One "a week after Christmas" morning, my mom saw one of our "well to do" neighbor about to put their old Christmas Tree in a trash. My mom asked if we can have it, and she said "yes"! And so the next year, we had a Christmas Tree. Oh, I held off on telling you what kind of tree is was - but you probably already have guessed (the title said it, duh!) - Yes it was an Aluminum Christmas Tree. Oh we loved that tree. We had it for many years! It was just a 4 ft tree but we always put it on top of a dresser to make it taller. One year we placed cotton around it so that it will look like snow :). 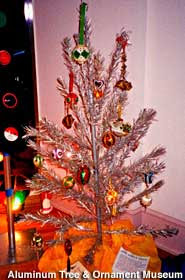 Oh there are so many memories associated with that old Aluminum Christmas Tree! 1) There is actually a Museum for the preservation of the Aluminum Christmas Tree. Check it out here. 2) Beyond 50 has an interesting article. It mentioned Charlie Brown and I found that amusing because last night when we were watching the Charlie Brown Christmas, I remembered chuckling when the aluminum Christmas tree was mentioned. I love the old aluminum trees! I bet it was beautiful! it's not about the stuff it's about the memories with the stuff..cool tree! I never saw a real aluminum tree! Reminds me of charlie browns christmas..when they look at the nice aluminum trees! Yes, I remember one in our front window. Oh how it sparkled. We had an aluminum tree too! But I'd forgotten until I read this. Thanks for the memory! Oh, Liza! I have never seen an aluminum tree, but my parents had a psychedelic Star at the top. It projected little colored stars around the ceiling, and they moved in a circle. Sort of like a disco ball. Those were the days! I bet Christmas trees are really expensive in Hawaii! We grow them here, and they're still expensive! Great story Liza. Reminds us all of our aluminum trees in the 60's..in our case, we had one with a twirling light shining on it that would change the color of the tree every minute. Thanks for the reminder.